When they defeated Ireland last Saturday on the road 1-0 in their World Cup 2010 qualifying playoff series, Les Bleus wore their Official adidas France 09/11 Home Soccer Jersey! With such a result, you can rest assured Anelka, Henry & Benzema will be wearing this shirt tomorrow @ the Stade de France, in the decisive second leg match. 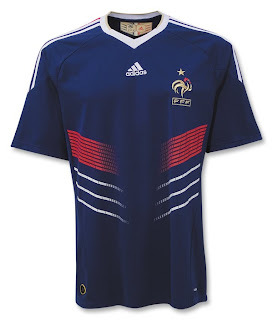 The new shirt is - yes - bleu with white trim at the retro-style collar, shoulder stripes and three slashes on the waist; with embroidered team badge over your heart, and adidas logo at center chest. With addias ForMotion: The innovative technology that offers maximum comfort and perfect fit, with features like three-dimensional design, different combinations of fabrics for greater flexibility and special stitching to eliminate friction during intense action. And it is made with adidas ClimaCool® - advanced material engineered to reduce heat and moisture build-up, allowing increased comfort and performance – to keep you feeling fresh no matter how long you play, train and cheer on Les Bleus!